Bell. is the first remedy that comes to mind in headache. Causation: Headaches from exposure to cold, hair cutting, exposure to sun (sunstroke), suppression of coryza, suppression of menses, injury to head, getting wet etc. Bell. headaches come suddenly, last an indefinite time and disappear suddenly. The headache is of congestive type. Blood rushes to the head. The head is hot, hands and legs are cold. Throbbing, hammering headaches, usually right sided. Violent throbbing in the head. Strong pulsation of arteries of the head. Boring the head into the pillow. Head pain begins at 3 p.m. or at 11 a.m. and peaking 3 p.m.
Bell. cures nervous sick headaches, congestive headaches, neuralgic headaches, when the pain is one sided, usually on the right side. Fullness, especially in forehead, also in occiput and temples. Patient is sleepy but cannot sleep. Headache with dizziness. Headache is aggravated by jar, motion, going upstairs, light, noise, sun, heat, washing the hair, touch, stooping, coughing, menses. Headache is better by cold application, lying in the dark, pressure (massage) from binding the head, by sitting, by lying, bending the head backward (semi-erect position). Bryonia is a prominent remedy for gastric, rheumatic, congestive headaches. Headache due to cold air, after taking cold, washing perspiring face in cold water, coffee, mental exertion, constipation. Bryo. is also useful in chronic headaches. Bursting, splitting or heavy crushing headache. As if forehead would split open. As if hit by a hammer from within. Fullness and heaviness, as if brain would fall out. Headache in occiput, extending to shoulders. Pressing pain over the left eye, extending to occiput. Drawing, tearing in right temple. Headache commences in the morning, keeps getting worse as the day advances. Throbbing ache on top of head. Congestive headaches, with feeling of bursting or splitting, which are seated in the forehead. Pain generally on the right side, increases gradually, may be accompanied by retching and bilious vomiting. Headache may be accompanied by nausea, vomiting, vertigo. Headache settles in occiput. Intolerance of noise during headache. Wants to lie down undisturbed. Headache worse from motion – even of eye-balls, stooping, coughing, straining at stool etc. Headache better by lying quietly and pressing. Gels. is a great headache remedy. Gels. is useful in catarrhal, congestive, sun headaches. Pain starts in cervical spine or occiput and spreads over the whole head and finally settles down in the eyes or forehead. Headache most violent in occiput, with stiff neck and heaviness of the eye-lids. As the headache begins the blurriness disappears. Patient feels as if head is full and big. Feels as if there is band around the head. The patient wants to lie with head raised upon a high pillow. One notable characteristic is that the headache is relieved by a profuse flow of urine. It cures headache due to abuse of tobacco. It is a good remedy for the sun headache. It is also a good remedy for headache due to eye-strain. The headache starts early in the morning, continues all throughout the day and disappears when the sun goes down. Headache is worse by mental exertion, from smoking, heat of the sun, lying with head low. Better from copious urination, pressure, lying with head high. Headache commencing with blindness and better by profuse urination is the characteristic of Gelsemium. It is one of the best remedy for chronic headaches. An excellent remedy for headaches in school girls during menses. Headache of school girls who are in anemic state. Headache as if hammers were pounding on the head, whenever they study. The headache starts in the morning, is worse about 10 a.m. It may begin at 10 or 11 a.m., last till 3 p.m. or evening. Periodic headache, every day or third or fourth day. Headache starts with blindness and zig-zag vision. Headache as if a thousand little hammers were knocking on the brain. Headache with nausea and vomiting. Dull frontal headache recurring daily about 10 a.m.
Headache worse from moving the head or eye-ball, noise, light, talking, mental exertion, reading. Better perspiration, lying with head high, pressure, moving about in the open air. Do not give Nat. Mur. during a severe attack. It may increase the headache. Give its ‘acute’—Bryonia, and after the relief give Nat. Mur. It is an important remedy for headaches. Nux. Vom. is useful in headaches connected with digestive or liver trouble. Causation: Headaches from gastric disorder, loss of sleep, tobacco, coffee, after taking cold, cold and damp weather, suppressed coryza, mental exertion. Sick headache brought on by alcohol, coffee, sedentary habits. Headache begins in the morning with giddiness on first rising and lasts all day until night. It is worse in the morning. Headache with vertigo, nausea and sour vomiting. Headache in the forehead as if eyes would be pressed out. The pain situated over one or the other eye, usually the left or else in the occiput. Headache may or may not localize in any particular part of the head. Headache in occiput or over eyes. Frontal headache and desire to press the head against something. Headache in sun-shine. Head feels distended. Heaviness, pressure and sensation of expansion in head, as if forehead were bursting. Headache worse from noise, light, in the open air, after eating, stopping, coughing, mental exertion. What relieves the Nux Vomica headache is not so clear. Certain headaches calling for Nux Vom. will be better by wrapping the head up warm and by rest, but these conditions are rare. Better in warm room, wrapping the head up warm, pressure, lying on the painless side, after rising in morning (except sick headache). Violent, sudden, restlessness and anguish are great characteristics of Aconite. Causation: Headache caused by dry cold air, suppression of coryza, sun-stroke, suppression of menses, congestion in the head. Violent pain in vertex, forehead and temples. Acute, sudden and violent attack of headache call for it. Burning headache, as if brain were moved by boiling water. Fullness and heavy feeling as if everything would push out of forehead. Increased secretion of urine during headache. Glon. is one of our most important remedies for sun-headaches, for headaches arising from suppression of the menses, for headaches following profuse uterine hemorrhage, for headaches from rush of blood to the head, for headaches in printers. Glon. is the only remedy having throbbing as characteristic as Belladonna. Useful in congestive, throbbing, pulsating, bursting, dull headaches. Throbbing in the head, forehead, temples, vertex, occiput. Headache increases and decreases with the sun. Headache in place of menses or before, during and after menses. Brain feels large, skull seems too small for the brain. Holds the head tightly and presses on the vertex. The eye-balls protrude during headache. Face and eyes red. It is also a very good remedy for summer headache, that lasts all summer. Headache worse from heat of the sun, shaking or jarring head, from stooping, ascending steps, lying down, bending backward. Better by cold application, keeping head high, from long sleep, open air, pressure, uncovering. Puls. is useful in headaches connected with menses. It is also useful in periodic headache. Causation: Headache from over eating, from ice-cream, ice-water, fat food, indigestion, suppressed menses. Tearing, pulsating, congestive, pressing, stitching headaches, with much heat in the head. Headache is chiefly in the forehead, over eyes and temples. Headache of the school girls at the time of puberty. Dull aching extending to eyes. Headache on one side, as if the brain would burst and eyes fall out. Periodic sick headache with vomiting of sour food. Sometimes pains are stupefying, wandering from one part of the head to the other. Sometimes the headache is behind the ear with a sensation as if a nail were driven in the brain. Headache worse in the evening and night. Headache worse heat, mental exertion, lying and sitting quite. Better by slowly walking in open air, cold or cold applications, pressure. Pain begins in nape of neck or occiput, comes up over the head and settles over eyes, especially right eye. Headache with nausea and vomiting. Periodic sick headache, every seventh day or third. Headache starts in the morning, increases all day (worse in the afternoon), lasts till evening. Vomiting of bile, yesterday’s food, then relief and sleep. Headache if he goes without food. Pain in the occiput and nape of the neck, pain extends down the back. Headache with nausea and chilliness. Sick headache and burning of soles of feet. Menstrual sick headache with profuse flow. It is especially suitable to women who menstruate too freely. Headache is so severe that the patient can neither tolerate noise nor light. Better by lying down (in the dark) sleep, vomiting and passing copious urine, open air, pushing head deep into the pillow. It is beneficial in various forms of headache-nervous, bilious, periodic. It cures paroxysmal headache which has existed for years in women with profuse leucorrhoea. Occipital headaches, extending to eyes. Violent headache as if the head would burst or the eyes fall out. Migraine with pain over one eye, of a throbbing character. Pulsating headache, beginning in the morning and last till noon and evening. Headaches are usually chronic and are accompanied by a pale, yellowish face, white coated tongue, aversion to food, constipation and leucorrhoea. Headache completely relieved by a good sleep, but if the patient awakened after sleep a short time, the headache is worse. Headache worse from any mental exertion, least motion, even turning eyes, stooping, going up stairs, lying on back, indoors, fasting, before or during menses. Better from a good sleep, violent motion as walking fast, perspiration rest, keeping perfectly quite, tight bandage or application of heat (though it is worse in warm room). It is very useful in headache. It cures headache after loss of fluids, hemorrhages, suppressed coryza etc. Violent hammering in the head towards the temples. Congestive headaches as if skull would burst. Pain from one temple to the other. Intense throbbing headache, face flushed. Brain feels loose, as if striking the sides of the skull. Headache and vertigo, worse by moving and walking, better by lying down. Occipital headache, extending to whole head, lasting from morning till afternoon. Stitches from temple to temple. Periodic headache, every day, every second or seventh day. Headache worse from draught of air, open air, sun, touch combing hair, walking. Better from hard pressure, rubbing, warm, moving head up and down, lying down (have to stand or walk), nose bleed. Headache due to abuse of quinine with ringing, buzzing, roaring in both ears. Violent pulsating, tearing or pressing pains in the forehead and eyes, with vertigo and heat in the face. Headache comes on during sleep, especially at 3 a.m. Pain in forehead and temples, increasing gradually at noon. Heat in the head during headache, better cold application. An excellent remedy for occipital headache. Nervous and gastric headaches, with nausea. Headache from working in the sun, menstrual headache, headache during pregnancy. Sick headache from riding in a carriage, boat, train, cars. The pain starts in the lower part of the occiput and neck, extends to the spine. Always with vertigo and nausea. Headache returns at menses regularly. Headache in occiput and nape with pain as if they were opening and shutting. Pulsating pains, sometimes in the crown of the head, sometimes in the temples. Headache, especially located in the occiput and nape of neck. Cannot lie on the back of the head but must lie on the side. The head feels as if it is tightly bound by a cord or as if nerves in the head are drawn up tightly. Headache as if skull would burst. Headaches of those who have indulge in masturbation, sexual excess and whose nerves have become feeble in consequence. Headache worse from any mental work, eating, talking, sleeping after, open air, riding in a carriage, coffee, tobacco smoking. Least jar unbearable. Better indoors, by rest, when becoming warm in bed. One of the best remedies for sick headache. Frontal headache over the left eye. Sick headache, begins with a blur before eyes. Headache, especially in the forehead and vertex, as if the top of the head would come off. Blurred vision before headache, with vomiting at the height of the attack. Fullness of the head and heaviness. Neuralgic headaches, generally one sided. When headaches are produced by eating sweets Iris is probably the remedy. Weekend headaches of those who work with their brain during the week and have an attack every Sunday. Most important remedy for migraine, generally right side. During headache nausea and profuse salivation. Recurrent sick headache with constipation. Shooting in temples, especially right. Headache worse evening, cold air, coughing, violent motion. Better from continual moderate motion, vomiting. Intense frontal headache, sharp pains from temple to temple, across eyes. Most severe in occiput. As if the skull would burst. Sick headache everyday 11 a.m. Attack of headache daily with clocklike regularity (exactly the same hour of the day). Periodic headache, every other day, every 4th day, 7th day. Pain throbbing, oppressive, stupefying, drawing, shooting and burning. Often one side and above one eye or at the root of the nose or in occiput. Headache better by cold, in the open air. But Ars. neuralgic headaches need to be wrapped up and kept warm. In chronic headaches, pains are often burning and ameliorated by heat. Sick headache with nausea, burning pressure on top of the head. Throbbing, bursting pains in head, as all the blood of the body had gone to head, sparkling before the eyes. Face bloated, attended with heat and coldness of extremities. Sun-headaches, whenever exposed to the sun. Headaches from suppressed discharges—nasal, uterine…. etc. Relief from their appearance. Headache begins in vertex and spreads over the head. Head heavy like lead, worse about occiput with vertigo. Rush of blood to head, after alcohol, during suppressed or irregular menses or at climaxes. Headache begins in the morning on waking. Headache with vertigo, nausea and vomiting. Headache worse heat, before menses. Better from menstrual flow, pressure. Great congestive and throbbing headache. Sense of coldness in the base of the brain. Headache with hunger or preceded by hunger. Burning and piercing pain in the forehead, often above one eye. Headache worse on fasting, heat, stooping, morning, when excited, music, walking fast, lying down, warm room, noise, light. Better by sleep, cold, open air, cold washing. It is a very good headache remedy of school girls. Headaches: Pains shooting, darting, stabbing, spasmodic, neuralgic, bursting, rheumatic. Headaches better by external application of warmth, hard pressure. Headache from debauchery, drinking wine, tea, lemonade etc. Selenium headache is associated with profuse flow of urine. Pain is located over the left eye, worse walking in the sun. Headache from bathing, from drinking beer, getting wet when perspiring. Brain feels loose when stepping or shaking the head. Occipital headaches associated with rheumatic stiffness of the nape of the neck. Headache worse from or caused by wet weather, change of weather, bathing. Left sided headache. Pains are neuralgic, boring, bursting, jerking in character, settles over the left eye. Headache begins in the morning, reaching the acme at noon and subsiding at the sunset. Headache worse from noise and jar, stooping, turning the head. Better by lying down. Especially useful for rheumatic and catarrhal headache in damp weather. Headache from exposure to cold, getting wet, damp and cold weather. Boring pain in the temples. Blurred vision or blindness before the headache. When the headache begins, the blindness disappears. Pain settles in a small spot and is very intense. Patient has aversion to light. The headache is often associated with nausea and vomiting. There may be pressive pain at the root of the nose with catarrhal symptoms. The patient must lie down. Headache worse from stooping, motion, walking. Better from warmth, warm drink. Congestive headache with fullness and heaviness. 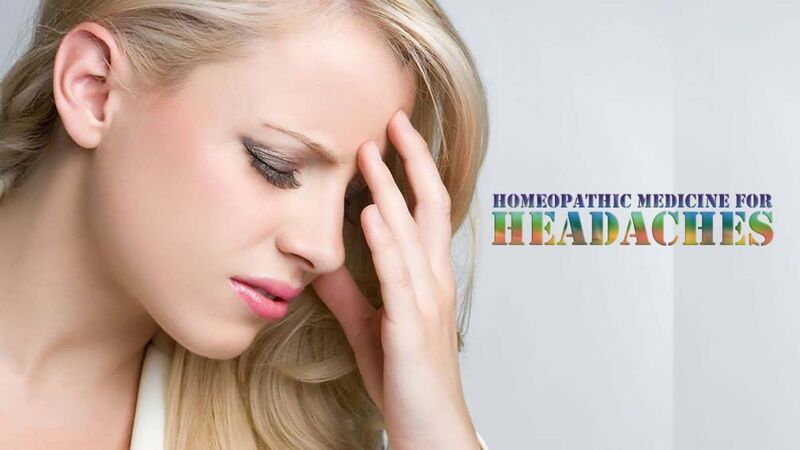 Headache increases gradually and disappears suddenly or appears and disappears suddenly. Hemicrania, pressive, screwing in frontal eminence or temple. Headache ends in bilious vomiting. Headache worse from mental exertion, dancing, open air. Better from binding head tightly, by pressure. Violent headache especially in frontal region. Pain as if needle or nail was driven into the head, better by lying on it. Headache with inclination to vomit. Pain in the small spot, that can be covered with the tip of finger. Headache is sometime accompanied by hunger. Sometimes the pain comes gradually and abates suddenly. Headache worse morning, coffee, smoking, noise, light, talking, stooping. Better lying down on painful side, profuse urination. Chronic sick headache with nausea, even vomiting. Headache begins in nape of neck and goes forward over vertex to eyes, especially right eye. Headache worse on exertion, noise, study, motion, jar, light, cold air. Better by wrapping head up warmly, heat, profuse urination, pressure, while eating. Diarrhea alternating with a morning headache. Heavy dull headache in the forehead. Morning headache with pain behind eyes. Sick headache, mostly in occiput; blurred vision before headache. Catarrhal headache, mostly in the forehead. Headache ceases during menses and returns when flow disappears. Headache worse on closing eyes. Better in open air. Worse on returning to warm room. Headache school girls from eye strain or over use of eyes. Occipital headache of students who are growing fast. Severe headache causing one to lie down, with stiffness. Crushing weight on top of the head. Violent shooting in the right temple, extending to the eye. Mainly the headache starts in the back part of the head and nape and usually extends forward. Headache worse by least motion, noise, especially music. Better by lying down, rest. Headache with hot-red face and vomiting of food. Headache better by cold application, nosebleed, lying. Worse riding in a carriage. Bursting headache, worse from motion, open air. Better hard pressure and wrapping up warmly. Shooting pain in right side of the head (right temple) extending to eye. Headache during thirst and belching. Chamomilla Headache ameliorated by rain. Staphysagria Headache after eating beef. Argentum Nitricum Headache from dancing. All the medication of homeopathic cure has been written by Dr K.K. Mahajan’s observation and experience. It is only in homeopathy that the symptoms and medicine has been written in all the posts clearly. It is the responsibility of a doctor to treat the patients taking into consideration their life and this is why we are thankful to Dr. K.K. Mahajan for the homeopathic blog.